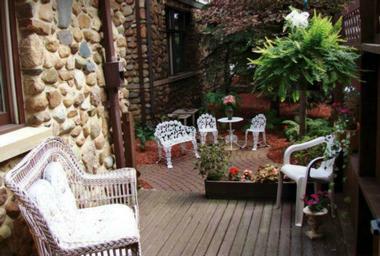 The Victorian Tudor Inn is a charming bed and breakfast in Bellevue, Ohio that offers guests a comfortable home-away-from-home retreat. 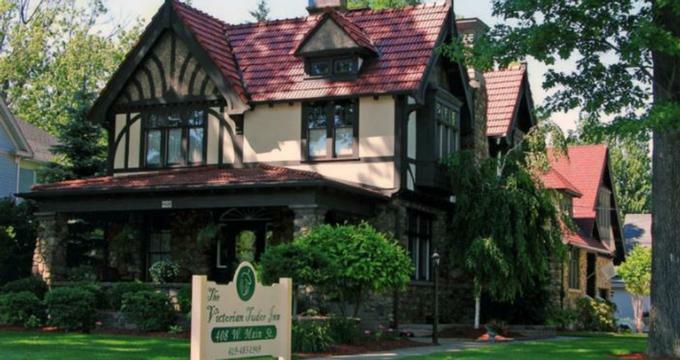 Featuring inviting communal spaces, including two living rooms with impressive fireplaces and beautiful wood paneling, five tastefully decorated guest rooms with private bathrooms, delicious complimentary breakfasts and gracious hospitality, The Victorian Tudor Inn promises an unforgettable escape. The Victorian Tudor Inn feature five well-appointed and tastefully decorated guest rooms with comfortable décor and furnishings and modern amenities. All rooms have private en-suite bathrooms with showers/baths/shower-and-bath combinations, plush queen or king-size beds dressed in deluxe linens and hypoallergenic pillows, thick towels and bathrobes and branded toiletries. Modern amenities abound and include hairdryers, irons/ironing boards, iPod docking stations with radios and alarm clocks, telephones with unlimited local and long distance calling (U.S. only), televisions with cable and satellite channels, and complimentary wireless Internet throughout the Inn. The Nautical Suite is an elegant suite that is artfully color and theme coordinated and features an impressive queen-size mahogany carved four-poster bed dressed in deluxe linens and hypoallergenic pillows. The suite has an en-suite bathroom connected to the room via a private foyer and offers a two-person Jacuzzi, two seat shower, thick towels and bathrobes and branded toiletries, candles and more. 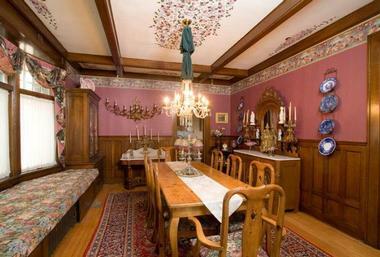 The room is beautifully decorated with antique furnishings, including an ornate ca. 1900 dresser, a comfortable couch, chair and a desk and a walk-in closet. The Nature Room is decorated with wooded scenery wallpaper in celebration of the wildlife around the area and features two magnificent 19th century double beds dressed with deluxe linens and hypoallergenic pillows, and an en-suite bathroom with a shower, thick towels and bathrobes and branded toiletries. A spacious sitting area is adorned with antique paintings, a Victorian-era love seat, and a mahogany desk and chair. The Greenslade Suite is a spacious two-bedroom suite with a separate, elevated sitting area furnished with antique pieces and period décor, a cherry and leather banker's desk and a hand carved oak armoire. The bedroom features an 1870 carved queen bed with new pillow-top mattress, deluxe linens, and hypoallergenic pillows, and a granite en-suite bathroom is accessed via the suite's private hallway and boasts a large Jacuzzi, granite vanity, and double shower. The Bellevue Room can be added to the Greenslade Suite to create a large unit for families. 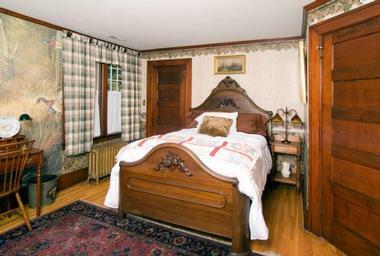 The room features a Civil War-era spoon-carved bed dressed in deluxe linens and hypoallergenic pillows and Victorian era furniture, including an oak wash stand with a wash bowl and pitcher. This room shares a bathroom with the Greenslade Suite if the two chambers are put together. The Royal Oak Suite is located on the first floor and boasts beautiful 12-foot ceilings with oak crown moldings. The suite’s bedroom is tastefully decorated with a magnificent three-piece Victorian marble top bedroom set, which includes a queen-size bed and hand carved headboard. The room is furnished with unique pieces such as a vintage cherry desk and Cherub carved chair, and an en-suite bathroom is adorned with granite and offers a shower, radiant floor heating, thick towels and bathrobes and branded toiletries. A delicious multi-course breakfast is served every morning and includes cereals, baked goods and pastries, cheeses and homemade jam, egg dishes, fresh fruit platters and squeezed juices, organic teas, and freshly roasted coffee, and more. Lunch and dinner menus are available on request. 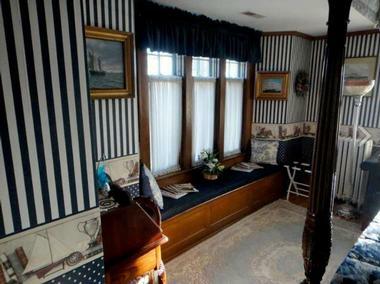 Amenities at The Victorian Tudor Inn include comfortable communal spaces with working fireplaces for relaxing and socializing, various newspapers, magazines, and CDs, a private business office with a desk, in-room massages and other salon services from Sass Salon and Spa and free on-site parking. The formal dining room offer refreshments and snacks throughout the day and a refreshment center on the second floor has a stocked refrigerator, microwave, and an ice machine. Bellevue, OH and the surrounding countryside offers a wealth of attractions, activities, and adventures for the whole family. The town itself is home to the 300-seat theater of the Bellevue Society For The Arts, who put on theater productions, concerts, recitals and other cultural events throughout the year. The little town is also known for its many antique shops and auctions, drawing collectors from far and wide to find treasures. Amish Country just over an hour away, while closer attractions include the Cedar Point Amusement Park, the Kalahari Water Park in Sandusky, the Green Hills Golf Course, the Fostoria Glass Heritage Gallery, and Jamie's Flea Market in South Amherst, to name but a few.